Francisco Pizarro González, Marquess c. 1471 or 1476 – 26 June 1541) was a Spanish conquistador, conqueror of the Incan Empire, and founder of Lima, the modern-day capital of the Republic of Peru. 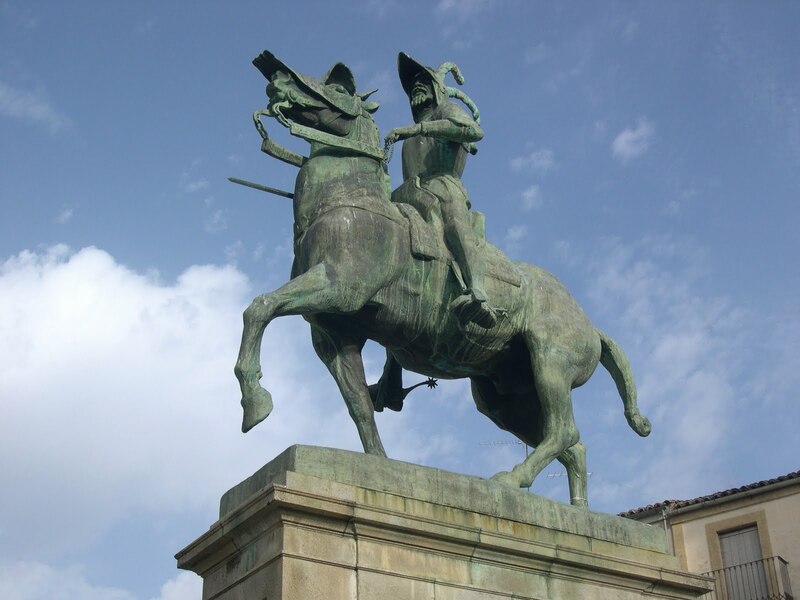 Pizarro was born in the town of Trujillo, in modern day Extremadura, Spain. Sources differ in the birth year they assign to him: 1471, 1475–1478, or unknown. 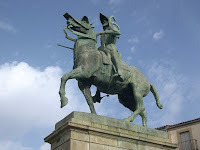 He was an out-of-wedlock son of Gonzalo Pizarro Rodríguez de Aguilar (senior) (1446–1522) who as colonel of infantry served in the Italian campaigns under Gonzalo Fernández de Córdoba, and in Navarre, with some distinction. His mother was Francisca González Mateos, a woman of slender means from Trujillo, daughter of Juan Mateos, of the family called Los Roperos, and wife María Alonso, labradores pecheros from Trujillo. His mother married late in life and had a son Francisco Martín de Alcántara, married to Inés Muñoz, who from the beginning was at the conquest of Peru, where he then lived, always at his brother's side, who held him always as one of his most trusted men. Through his father, Francisco was second cousin once removed to Hernán Cortés, the famed conquistador of the Aztec Empire. On 13 February 1502, Pizarro sailed from Spain with the newly appointed Governor of Hispaniola, Nicolás de Ovando y Cáceres, on a fleet of 30 ships. It was the largest fleet that had ever sailed to the New World. The 30 ships carried 2,500 colonists. In 1532 Pizarro once again landed in the coasts near Ecuador, where some gold, silver, and emeralds were procured and then dispatched to Almagro, who had stayed in Panama to gather more recruits. Though Pizarro's main objective was to then set sail and dock at Tumbes like his previous expedition, he was forced to confront the Punian natives in the Battle of Puná, leaving three Spaniards dead and 400 dead or wounded Punians. Soon after, Hernando de Soto, another conquistador that had joined the expedition, arrived to aid Pizarro and with him sailed towards Tumbes, only to find the place deserted and destroyed. Their two fellow conquistadors expected they had disappeared or died under murky circumstances. The chiefs explained the fierce tribes of Punians had attacked them and ransacked the place. As Tumbes no longer afforded the safe accommodations Pizarro sought, he decided to lead an excursion into the interior of the land and established the first Spanish settlement in Peru (third in South America after Santa Marta, Colombia in 1526), calling it San Miguel de Piura in July 1532. The first repartimiento in Peru was established here. After these events, Hernando de Soto was dispatched to explore the new lands and, after various days away, returned with an envoy from the Inca himself and a few presents with an invitation for a meeting with the Spaniards. Following the defeat of his brother, Huascar, Atahualpa had been resting in the Sierra of northern Peru, near Cajamarca, in the nearby thermal baths known today as the Baños del Inca (Incan Baths). After marching for almost two months towards Cajamarca, Pizarro and his force of just 106 foot-soldiers and 62 horsemen arrived and initiated proceedings for a meeting with Atahualpa. Pizarro sent Hernando de Soto, friar Vicente de Valverde and native interpreter Felipillo to approach Atahualpa at Cajamarca's central plaza. Atahualpa, however, refused the Spanish presence in his land by saying he would "be no man's tributary." His complacency, because there were fewer than 200 Spanish as opposed to his 80,000 soldiers sealed his fate and that of the Incan empire. Atahualpa's refusal led Pizarro and his force to attack the Incan army in what became the Battle of Cajamarca on 16 November 1532. The Spanish were successful and Pizarro executed Atahualpa's 12-man honor guard and took the Inca captive at the so-called ransom room. Despite fulfilling his promise of filling one room (22 feet (7 m) by 17 feet (5 m) with gold and two with silver, Atahualpa was convicted of killing his brother and plotting against Pizarro and his forces, and was executed by garrote on 26 July 1533. Pizarro wished to find a reason for executing Atahualpa without angering the people he was attempting to subdue. Pizarro's brother Hernando and de Soto opposed Atahualpa's execution, considering it an injustice. They objected to the evidence as wholly insufficient and were of the opinion that Pizzaro had no competence to sentence a sovereign prince in his own dominions. A year later, Pizarro invaded Cuzco with indigenous troops and with it sealed the conquest of Peru. It is argued by some historians that the growing resistance from the new Inca, Manco Inca Yupanqui, prolonged the conquest. Manco Inca Yupanqui was the brother of the puppet ruler, Tupac Huallpa. "This city is the greatest and the finest ever seen in this country or anywhere in the Indies... We can assure your Majesty that it is so beautiful and has such fine buildings that it would be remarkable even in Spain." After the Spanish had sealed the conquest of Peru by taking Cuzco in 1533, Jauja in the fertile Mantaro Valley was established as Peru's provisional capital in April 1534. But it was too far up in the mountains and far from the sea to serve as the Spanish capital of Peru. 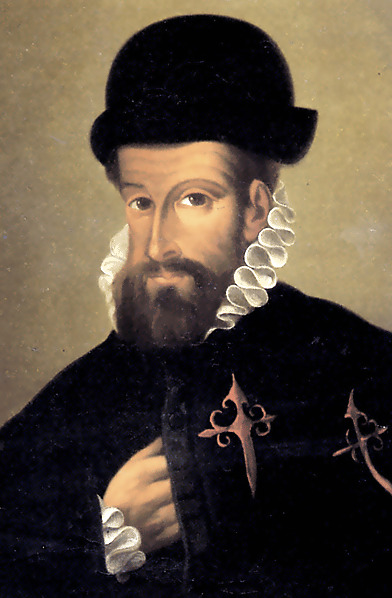 Pizarro thus founded the city of Lima in Peru's central coast on 18 January 1535, a foundation that he considered as one of the most important things he had created in life. After the final effort of the Inca to recover Cuzco had been defeated by Almagro, a dispute occurred between him and Pizarro respecting the limits of their jurisdiction. This led to confrontations between the Pizarro brothers and Almagro, who was eventually defeated during the Battle of Las Salinas (1538) and executed. Almagro's son, also named Diego and known as "El Mozo", was later stripped of his lands and left bankrupt by Pizarro. Atahualpa's wife, ten year old Cuxirimay Ocllo Yupanqui, was with Atahualpa's army in Cajamarca and had stayed with him while he was imprisoned. Following his execution she was taken to Cuzco and given the name Dona Angelina. By 1538 it was known she was Pizarro's mistress, having borne him two sons, Juan and Francisco.